Held annually at the Tournament Players Club (TPC) in Scottsdale, Arizona, tickets for the Waste Management Phoenix Open, one of the premier golf tournaments in the United States, aren’t exactly easy to come by due to its immense popularity. Lovingly referred to as "The Greatest Show on Grass" the Waste Management Open is normally held during the latter part of January and/or the beginning of February and, according to the Professional Golf Association (PGA), it’s the largest tournament that professional golfers can enter every year on the prestigious PGA Tour, making passes for the Waste Management Phoenix Open relatively expensive. Formerly known as the Arizona Open when it started back in 1932, the Waste Management Phoenix Open has also gone by the name the FBR Open, after the bank that began sponsoring it in 2003, Friedman Billings Ramsey. 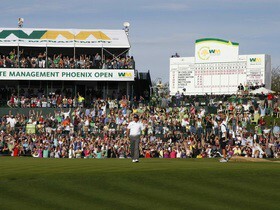 For most of its history however it was known simply as the Phoenix Open. It is currently sponsored by Waste Management AZ. As well as changing names several times the Waste Management Phoenix Open has also moved around as well during her history. It began, as previously mentioned, in 1932 at the Phoenix Country Club. It was only held for 4 years before it was discontinued after 1935's tourney. It was lovingly (and almost single-handedly) revived by Bob Goldwater, Sr. in 1939 and continued to be held at the Phoenix Country Club until 1954. Goldwater was a member of the local Phoenix Chamber of Commerce, referred to as the Thunderbirds due to their mascot, the proud symbol of the American Indian. Starting in 1955 the Waste Management Phoenix Open was also held at the Arizona Country Club in Phoenix on alternate years, sharing duty with the Phoenix Country Club until 1975 when it shifted back to the latter permanently until 1986. Since 1987’s Waste Management Phoenix Open it’s been held in its current location in Scottsdale, Arizona at the TPC Stadium Course. Tickets to the Waste Management Phoenix Open should be purchased well in advance for the best viewing locations and prices. They don’t call the Waste Management Phoenix Open the Greatest Show on Grass for nothing. A 4-day event, the tournament normally attracts about 500,000 visitors every year. In 2013 it set a record for the single day attendance at a PGA tour event with 179,022 in the stands, and then it broke the single day record again in 2014, with a Saturday showing of 189,772. It also broke the Weekly attendance records for a PGA event with 563,008 fans in attendance during its 4 days that year. There's no question about it's most popular hole, the 16th. Similar to an amphitheater once the stands are erected, it's definitely a party atmosphere and has been privy to a number of amazing shots over the years, including Tiger Woods’ hole-in-one in 1997 and Jared Lyle’s ace in 2011. Phil Mickelson, and alumni of local Arizona State, is without question the most popular golfer at the tournament, and some of its most ardent fans are students from his same Alma Mater. They get their tickets for the Waste Management Phoenix Open early and crowd the 16th hole every year, as well as the so-called ‘Bird’s Nest”, a nearby location where a concert and party are held very year in Scottsdale. History was also made at the Waste Management Phoenix Open in 2001 when Andrew McGee scored the second of only 2 double-eagles in the tournament’s history. That was on the 332 yards, par 4 17th hole, where McGee was the first to ever make a hole-in-one. If you’e planning on gong to the Waste Management Phoenix Open in 2016, purchasing Waste Management Phoenix Open Passes to the event now is a very good idea for the best prices and viewing locations. Phoenix can be considered as the best place in order to play golf. It has a beautiful climate, which is suitable for golfers. The place is quite warm during winters. There are so many beautiful views, outstanding golf courses, exciting phoenix night life, and world class restaurants. This may be the reason that this is the best location chosen by the golfers all around the world. Phoenix has almost 200 golf courses, and during winter season, the visitors arrive at this place to enjoy golfing and the natural beauty. And thus during winters there is a huge increase in the price and thus making several golf courses expensive. But there are several other golf courses that are available on affordable prices without any compromise in the quality of the course. If you love playing golf then phoenix is the best place to spend your vacations. There are a plenty of resorts offering variety of services, and thus making your stay pleasant. Regardless of what kind of golfer you are or what courses you prefer, you will find what you are looking for in Phoenix. There are some golf resorts that offer all-Inclusive packages. It means that the resort will provide everything you wish for like your meals, drinks etc. Also some of them offer other sporting activities for the sake of entertainment purpose. And you can take part in other activities besides golfing. The 18-hole Golf Club features 7,135 yards of golf from the longest tees for a par of 72. The course rating is 74.1 and it has a slope rating of 143 on Bermuda grass. Designed by Thomas Fazio, ASGCA, the Raptor golf course opened in 1995. The 18-hole "Monument" course at Arizona features 7,070 yards of golf from the longest tees for a par of 72. Designed by Tom Weiskopf, the Monument golf course opened in 2007. The 18-hole Golf Course features 6,569 yards of golf from the longest tees for a par of 72. The course rating is 70.5 and it has a slope rating of 119. Designed by Bob E. Baldock/Robert L. Baldock, the Desert Lakes golf course opened in 1989. The 18-hole "Stonecreek" Golf Club facility features 6,871 yards of golf from the longest tees for a par of 71. The course rating is 72.8 and it has a slope rating of 131. Designed by Arthur Hills, ASGCA, the Stonecreek golf course opened in 1979. The 18-hole golf course at Country Club facility in Glendale, Arizona features 7,001 yards of golf from the longest tees for a par of 72. The course rating is 73.2 and it has a slope rating of 124. Designed by Arnold Palmer. It's been likened to a frat party. It's been called the loudest hole in golf. Every year, TPC Scottsdale's 16th hole transforms from a quiet and unassuming 160 yard direct approach par 3, into the PGA Tour's bad boy/black sheep/rock star hole during the Waste Management Phoenix Open. There isn't anything quite like "Sweet 16" anywhere else on the PGA Tour, and it has to be experienced to be believed. Part intimidating, part infuriating and part intoxicating, the allure and myth of the 16th can't be avoided. It is surrounded by grandstands and skyboxes, with deep lines of people waiting to enter its inner confines, where up to 20,000 people surround the hole from tee to green. It resembles a small baseball stadium dropped into the middle of a golf course. Perhaps the stadium feel is why the crowd is known to engage in "the wave" from time to time. Yes, we are talking about a PGA Tour event, and the wave is the least surprising activity at Sweet 16. You can walk around it and not see the green or the tee boxes, but there is a rumbling noise emanating from within that rises to roars, jeers, chants and wild exuberance every few moments. There is a small spot you can catch a view of the green from the outside, but you will be in a swarm of humanity crowding the area and you're better off checking Twitter to see what's happening inside; don't worry, people will be tweeting about it. Of course, you could shell out some serious dough for skybox entry, or spend upwards of two hours waiting in line for the free grandstand seating. Either approach should be on your bucket list. This is a Happy Gilmore kind of joint. Players who emerge from the tunnel with a cult of personality streaming behind them tend to absorb the energy that crackles from the stands. Bubba Watson tossed Oakley ski glasses to the crowd on Friday. Padraig Harrington kicked a football into the stands the day before Super Bowl XLVII, showing his timing is impeccable. Caddies race onto the hole, this year falling down as they hit the fringe, to the glee of the crowd. Russell Henley even reached out on Twitter: "Dear Fans on #16, I love you, how bout gettin real real loud today? #thankyou." Ian Poulter riled the crowd up, pushing them to make more and more noise, which they were more than willing to do, and proceeded to tag a great shot to a backbeat of wild euphoric yelling. On day 4, James Hahn completely brought the house down with a stirring Gagnam Style celebration over the hole after he birdied. Phil Mickelson just brings himself, and that's enough. Local legend Lefty doesn't need to do anything fancy to win over the crowd. They love him. Even before he is visible, the chants of "ASU, ASU" ring the hole. Phil attended Arizona State University, and the current student body is well represented in Sweet 16's gallery, doing their best to keep the ASU party school reputation alive. Phil puts on a show, routinely putting the ball on the green to the delight of the crowd. On day three of his dominating performance in the 2013 Waste Management Phoenix Open, he came a foot away from acing the hole and the crowd exploded. But not everyone is a fan of Sweet 16. If you have the misfortune of missing the green get ready for the boos, the kind you'd hear if you missed a Super Bowl game winning kick. They even rained boos on Olympic gold medal collector Michael Phelps in the pro-am leading up to the event, just because his ball missed the green and he didn't recover as well as the crowd wanted. And he's just an amateur. Golf traditionalists abhor the hole, rolling their eyes at juvenile chants aimed at women in the crowd, golfer's personal lives and other very non-traditional behavior that is now the norm (and the tradition) at 16. CheapTicketsASAP.com acts as an intermediary between buyers and ticket sellers to facilitate the purchase and sale of Waste Management Phoenix Open tickets, and as such is not directly involved in the actual ticket sale transaction between the buyers and TICKET SELLERS. All sales are final. As tickets sold through CheapTicketsASAP.com are often obtained through the secondary market and prices are determined by the individual seller, the prices for tickets may be above or below face value. Waste Management Phoenix Open Tickets sold through CheapTicketsASAP.com are from a third party; therefore, the buyer's name will not be printed on the tickets. Tickets may be sent by email when stated so. Please note that the name on the tickets does not affect the buyer's ability to access the Waste Management Phoenix Open event.